How does a girly girl like Lexi likes fixing up things and helping daddy assemble toys? Wait till you see her with a toy hammer and a screwdriver pounding at our walls. I just had to share this super cute exchange between the two of them when I asked Andrew to help me assemble our new Strider Balance Bike. Now we just have to get her a helmet and she’s off to learn how to ride a balance bike! Ha! That’s exactly the helmet brand I was looking at. Lexi does too. The green toys one. So cute! Way too cute! Nothing sweeter than daughters and their daddy. Funnily enough, my Juliet’s favorite book is about a daddy and little boy helping him build a dog house. Maybe we need to buy her a tool set?! Already?!? Has she mastered her Smart Trike already?! Oh no, pedaling has nothing to do with balancing. 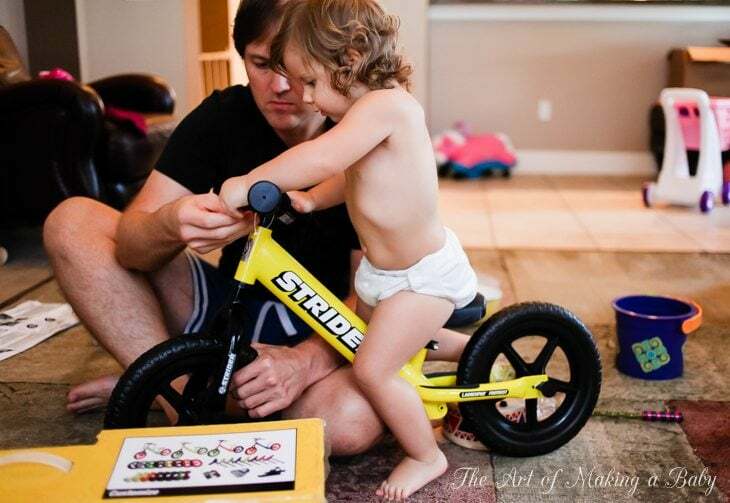 The balance bike is to learn balance, once that’s mastered the pedaling is easy enough. We’ll probably do both at the same time. I’m not sure which ones she’ll learn first, but balance bike can be started at 18 months. I love this series of pictures! Axel was a daycare playmate of my daughter’s, and he was sadly killed in Mexico about 4 months ago. This charity his parents have started donates a Strider bike to a child in need for every bike bought. It’s a great cause in memory of a great kid for exactly the same price as you’d buy the bike on amazon or elsewhere. Elena–I can’t believe how much Lexi has thinned out since she started walking. Where is all that adorable chub? She’s really a toddler! Lexi’s fine motor skills are AMAZING!! My daughter has always wanted to help anytime it comes to tools, she would always amaze me at how intricate she would get and all the things she remembers from working on projects with her dad! She was never content with pretend tools she needed the real deal. Wow, she looks very cute. I love these pictures, really fun when dad and daughter help each other. Very happy!